Fantastic veranda with a view of the sea and the sunset. Very close to the Chora and Katapola. The staff was also very friendly. Η ιδιοκτήτρια εξυπηρετικη με διάθεση να μας δώσει τις καλύτερες πληροφορίες για τα αξιοθέατα του νησιού. Très belle vue sur la mer et terrasse ombragée et calme avec un bougainvilliers magnifique. Chambre un peu petite, mais confortable. Espace cuisine suffisant pour le petit déjeuner ou un dîner simple. 10 bonnes minutes de Katapola et de la plage la plus proche par un petit sentier. Personnel discret et très sympathique. La anfitriona muy amable, la casa excelente, muy agradable, con buen gusto y muy limpia. Servicio diario de limpieza. El patio perfecto. La casa, piccola ma funzionale, è immersa nel verde, in una zona ottima per muoversi sull'isola. La nostra ospite è stata molto gentile e disponibile. Ottimo rapporto qualità prezzo. Lock in a great price for Villa Katapoliani No.3 – rated 8.8 by recent guests! 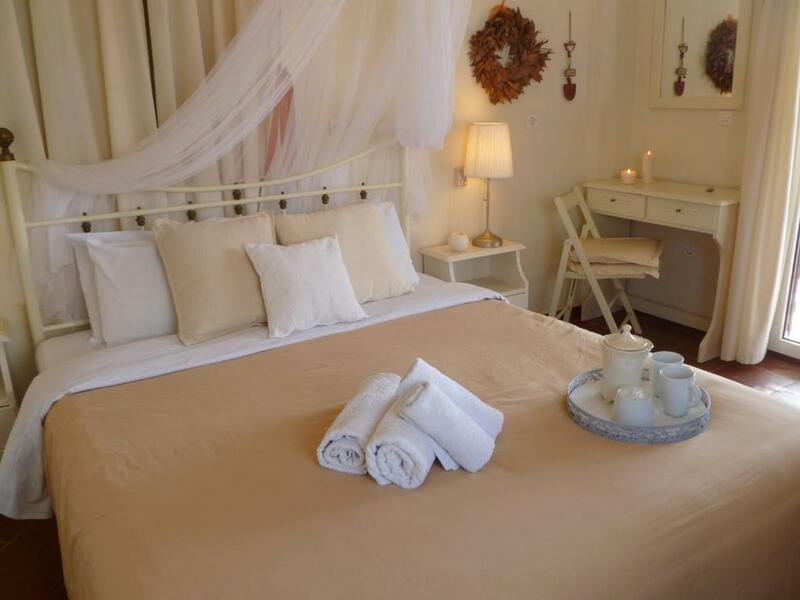 Located in a quiet area of Katapola, 2,650 feet from the port, Villa Katapoliani III is a Cycladic-style complex offering romantically decorated studios and apartments with kitchenette and free Wi-Fi. All air-conditioned units feature white iron beds with mosquito nets and open out to a furnished balcony or patio, most with Aegean Sea view. They include a TV and a kitchenette with mini fridge and cooking rings, while most also have a dining area. Villa Katapoliani is 1,000 feet away from the nearest beach. Within walking distance, you can find traditional taverns and cafes. The charming main town of Amorgos is around 3.7 mi away. Free private on-site parking is available. When would you like to stay at Villa Katapoliani No.3? This romantically decorated apartment consists of a separate bedroom with iron bed and mosquito net and an open-plan kitchenette with dining and living area. It also has a TV, air conditioning, free Wi-Fi, a bathroom with a built-in shower and opens out to furnished balcony or patio. Overlooking the Aegean Sea from its shaded, furnished veranda, this romantically decorated apartment consists of 3 rooms; 2 bedrooms and an open-plan kitchenette with a white dining area. A TV, air conditioning and free Wi-Fi are also included. Villa Katapoliani 3 is a paradise with palm and olive trees ,800m of the center.All the rooms are romantic and have country decoration .Next to the road to Chora and all the villages is the entrance to the complex so that you can directly take the bus. In addition there is privet parking in the comlex. I love the decoration and i like to improve my rooms every year. Around Villa Katapoliani 3 there are fields with olive trees. House Rules Villa Katapoliani No.3 takes special requests – add in the next step! Villa Katapoliani No.3 accepts these cards and reserves the right to temporarily hold an amount prior to arrival.